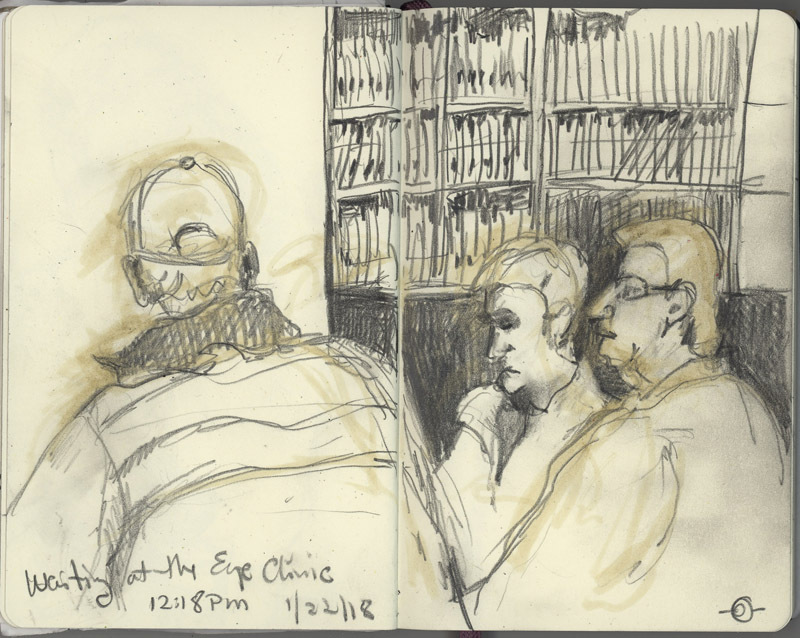 When my husband John couldn’t make out the largest E at the top of the eye chart, the eye doctor announced it was time for him to have cataract surgery. The right eye was scheduled first. We arrived before dawn on Monday at Sartori Hospital for the outpatient procedure. Sartori is the only hospital in Cedar Falls. It’s a mile from our house. It’s where my daughter was born 30 years ago. It’s where I had cancer surgery 25 years ago. It’s our hospital. Significantly, this was my 73-year-old husband’s first surgery. After he changed into a hospital gown and donned a puffy fabric cap, the nurse put drops in the target eye and covered it with a clothe. She hooked him up to a monitor and inserted an IV. John, until his retirement 10 years ago, was a physician. For so long, he was the person who put the needles in. The teamwork, the organization, the timeliness, everyone was so expert and cheerful. 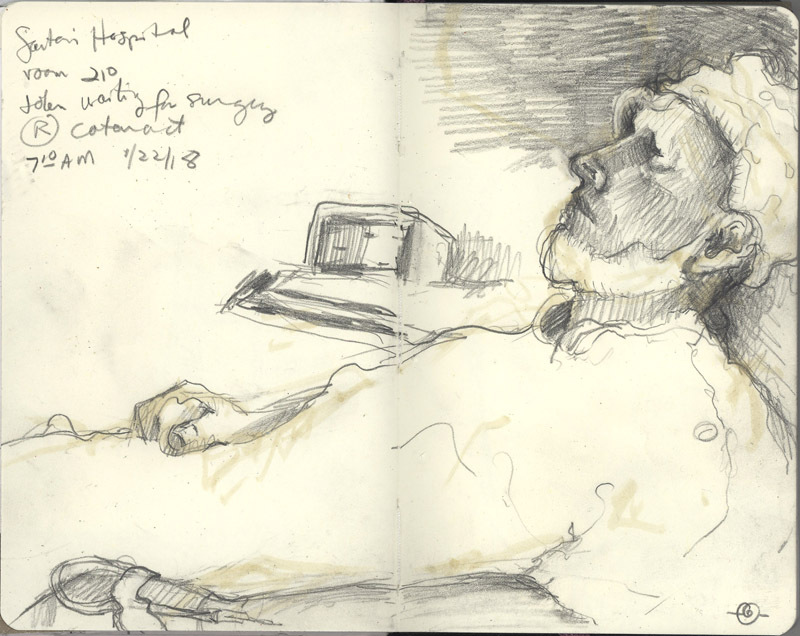 Once he was prepped, I had just enough time to draw John (above) before he was wheeled down to the surgical suite. Meanwhile, I waited with the other waiters. Extracting a cataract and inserting a new lens takes so little time. 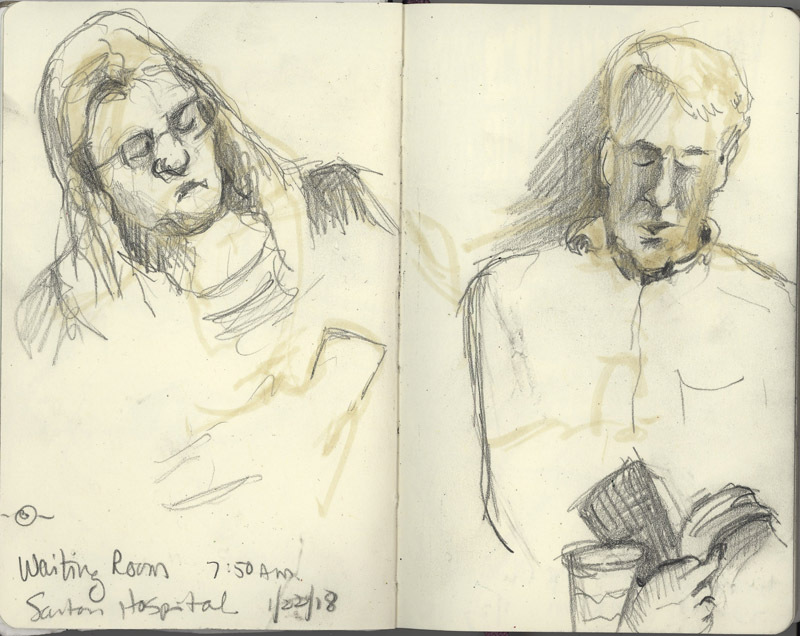 Besides partaking in a slice of homemade banana bread that the troupe of smiling volunteers offered, I was able to do one more quick drawing (above) before the surgeon came out to announce it was all done and had gone well. Back up to the room, a clear plastic, protective cup taped over his eye, the discharge nurse went over what he should and should not do. She was personable and clear. “Any questions?”, she asked. It was time to go home. It was now light. I drove the patient through a drizzly, cold rain. We were home resuming our usual morning routine–eating breakfast and scanning the internet news–in no time. At noon, we went back for the eye doctor to make sure everything was as it should be. All good. Some of the same people I’d seen at the hospital waiting room were here at the eye clinic waiting room. I would have been happy to have had more time to sketch. I’ll just have to delay to do more waiting room sketches. John’s left eye is scheduled for early February. And by the way, John could immediately see better! What a miracle of modern medicine. Even with only one eye fixed, the sky is bluer, the white tile backsplash in our kitchen is no longer a dirty, yellowish brown. He can read the small print again. An avid watcher of nature, he can resume spotting the birds in our backyard trees and naming them. He can see the squirrel’s claws as it adeptly gnawed on the nuts that John had left out for it on the stone wall. What a gift.